IT’S tiny, darts hither and thither, hovers on the spot while sipping nectar and builds an intricate, teardrop shaped nest decorated with bits of shiny stuff, ‘cemented’ together with a liberal amount of spider webs. 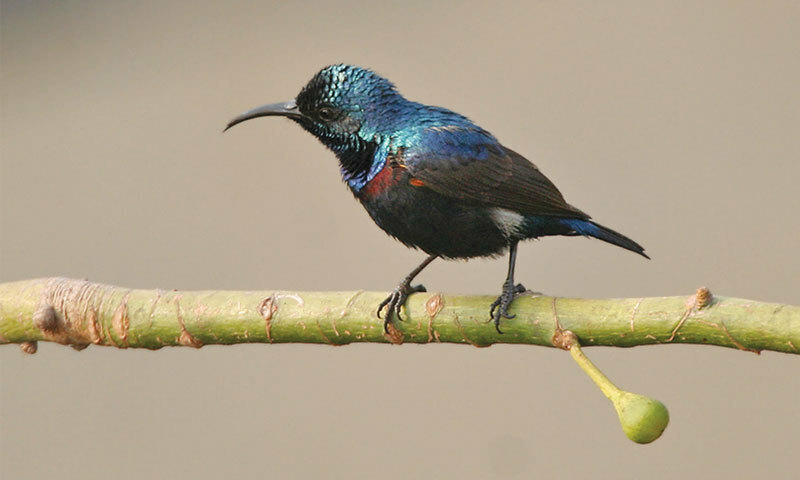 The male of the species, when caught in a sunray, shimmers deep purple, amethyst, brilliant blue and electric green: This little dazzler is ‘Nectarinia asiatica’, better known as the ‘purple sunbird’ and often mistakenly referred to as a hummingbird which, unfortunately, does not exist here in Pakistan at all. Widespread and fairly common throughout the plains of the country, including right there in cities such as Karachi and Lahore, it has a body length of just 10cm, a wing length of just 5.1cm – 5.7cm, a tail length of about 3.5cm – 3. 8cm, a bill measuring up to 21.5cm and weighs in at a very light 5 – 10gms with the less colourful female being heavier than the brilliantly hued male. The female, decked out largely in dull olive grey and brown with a lemon yellow chest, is far less noticeable than the male, although he too sheds his shimmer for the winter and regains his gorgeous sheen come spring when the mating season begins. Often nesting in colonies, these nectar sipping birds have a long, scimitar-shaped beak to help them reach the nectar hidden in the deepest throat of flowers and, being remarkably clever, some even drill a hole at the base of the flower so that sipping the nectar becomes more easy! Not at all shy of humans, these beautiful little birds are quite at home in gardens and even on balconies as long as food-source flowers are close by. The female lays two or three, greyish coloured, brown spotted eggs which hatch after about 15 days and she may raise up to three lots of chicks a season. Purple sunbirds, in the very south of the country, may begin breeding in March and continue through until the end of August all depending on the average temperature and on weather conditions too. Those residing further north, usually breed from mid-April to early August. Among their favourite nectar flowers are climbing vines such as black-eyed Suzie (thunbergira), trumpet vines (tecoma grandiflora) and they also enjoy the quick to access, nectar of passion flowers (passiflora) along with the nectar of numerous other shrubs, perennial and seasonal flowers. When there is a shortage of available nectar, sunbirds will feast on tiny flying insects and even on small caterpillars too. You can, if you like and with your parents’ permission, put out a little honey on a saucer to see if you can attract sunbirds to your home but — please be careful in doing this as you will attract bees and wasps too!